Looking around for aftermarket parts I like AND can legally install on a Z (for road use) in Germany I came across the "Pantera hatch" or "inverted hatch". I know they're a bit polarizing, and apparently rather rare. Can someone give me a little bit of information on those things? Are there companies that sell them? Or are they only to be found on the used market? Or are they DIY-pieces made out of the conventional hatch? I'm asking because the hatches slightly differ in some pictures. Does/did anyone here run that part? If so, where did you get it/who made it? Also, in this picture it seems like the car has an inverted hatch and a roll bar, does anyone have any information/experience in combining that type of hatch with a roll bar/-cage? Because I'd want the added safety, the law is probably going to require a bar/cage for stiffening, and since I got very little idea about how a car with an inverted hatch looks inside I wonder if it's possible to combine the two. You are correct on all counts. I haven't seen any produced anytime recently. They will occasionally pop up for sale in used condition, but they are becoming extremely hard to find. Apparently, they are a bit more readily available in Japan than elsewhere....but not cheap. Some guys have fabricated their own custom hatches, which may account for the differences in style that you noted. I'm fairly certain that molds still exist, so you might be able to have someone create a single hatch for you from a mold. Check out the discussion threads on ClassicZCar.com, and you might get some useful leads. I personally like the look of the Pantera hatch, but not everyone does, as you've already noticed. Whatever you decide to do, good luck with it. If you're planning any aero mods in the back skip it, as it creates massive flow separation and lift. If you check the windtunnel testing info in the FAQ, you can see it has the highest rear lift number of any of the tests. Makes me wonder what people are thinking when they put on the Pantera hatch and a spoiler or wing, or the worst combo, roof spoiler with Pantera hatch. It also increased the drag by .2 which is the equivalent of setting the wing that was tested for its highest angle of attack. So you get all the drag of pulling a wing through the air, and quite a bit less than none of the downforce. If you are just in it for looks, it appears to me like there will be plenty of room for a roll bar. Most of us try to get the main hoop of a roll bar as close to the rear fenders as possible and as tight against the map light area as we can, that's still well forward of where the hatch is though. This guy posted a few years ago that he makes them. You could reach out on the thread and see if he is still around and able to make them. I found an article on Speedhunters on a 240 running an inverted hatch (“Airone R-Gate”) and a roll bar. Might just be a style bar, but it looks like there’s enough space for a bar and slightly angled supports behind the buckets in this version of the hatch, from where one could extend to the front as a cage. The rear domes (ideal points to mount to) might be too far back though. As for finding a hatch, I got a contact to a company that imports cars and car parts from Japan, so it might be a good idea to, when the time comes, contract them to find one. Just put the supports off of the hoop on the sides, they'll fit in around the hatch window. Mine go from the sides of the hoop just below the bends to the top of the strut towers. That one shown above is terrible. If there is a fore/aft load on the main hoop if the car rolls, there is almost no support for it. Would fold like a mousetrap. IIRC, I remember seeing Pantera hatches in an old paper Arizona Z Car catalog from the 90s. Maybe he has the moulds buried somewhere, or a lead. Perusing the data from that 2007 wind tunnel test, I'm baffled by the results for the Pantera hatch. Intuition suggests that flow is already separated near the front lip of the stock hatch, and then continues as a set of oscillated separated rollers. This is because the stock hatch angle was poorly chosen. It’s too steep (pressure gradient too high) for attached flow, yet less efficient than a blunt (high angle), abrupt rear element… such as for example the back of a VW Rabbit. The rationale for Pantera hatch is to get up on attached flow, instead taking the pressure-drag penalty on the rear windscreen, but hopefully getting flow reattachment further downstream over the hatch. It is possible that this latter phenomenon wasn’t achieved in the wind tunnel test. I’m not criticizing the wind tunnel test, but am pointing out that (1) the result was counterintuitive, (2) the drag increase from the Pantera hatch was still small, compared to the unrelated issue of what’s done at the radiator/nose/airdam, and (3) design-variations on the Pantera hatch are still possible, which may actually reduce drag, instead of increasing it. By my reckoning, the benefit of a Pantera-style hatch isn’t a “hatch” at all, but a fixed lid over the trunk-area, merging into a fixed rear glass (or plexiglass). The benefit is (1) save weight, and (2) isolate the cabin from the fuel-cell and battery (assuming a trunk-mounted battery). If there is aerodynamic benefit, then that’s a bonus, rather than a main objective. The rear hatch is relatively steep, but you don't have a chance in hell of getting the flow to reattach with a Pantera hatch. Yes, an abrupt surface can be used to decrease the overall area of unattached flow, but that's done by reducing the closeout angle and then abruptly changing slope. You aren't doing that when you add a Pantera hatch. You're taking the same slope that isn't ideal and then making it worse. It makes perfect sense to me and isn't counter-intuitive at all. Agree with calZ. I'd like to see some better shots of the yarn on the stock hatch. I would bet that the separation is not that bad; that there is separation, and it is creating drag, but not in a huge way. If you look at the VG test from the windtunnel, it actually shows an INCREASE in rear lift. Unfortunately they also took the side skirts off when they did this test, so it's not really a good indication of what exactly the VGs did. All we can really say is that the net change of removing side skirts and adding VGs resulted in increased rear lift and increase in drag by .04. The VG thing bothers me for a more fundamental reason though. If you look at a low speed aircraft wing, they put the VGs close to the leading edge of the wing. Most everyone who runs VGs on cars is following the Mitsubishi example, but I don't think it's really all that relatable to the Z. The EVO has a relatively flat roof and a sharp rear window angle. The Z has a bubble roof that leads smoothly into the slope of the hatch. I really think that VGs on a Z should be mounted close to the top of the windshield, and getting rid of the hump from the weatherstripping around the rear window is probably as important. Here is a video from a guy on another forum. I know you can't really compare different cars, but the point was to show that it is possible to have some separation without huge roiling vortices coming off the back (which would have the yarn standing flipping all around, including straight up). My GUESS is that this is somewhat similar to what happens on a Z. We do have this shot, but there is a spoiler on the car. Even so, there isn't any yarn pointing backwards or standing straight up. The VGs are near the leading edge on a wing because that's where the most curvature is and where the boundary layers needs more energy to stay attached at high angles of attack. I don't know exactly what the flow looks like coming over the rear of the windshield, but I'd guess it's relatively well-behaved over the roof. The lift increase with the VGs tells me that they increased the speed of the flow over the hatch. That's always the problem with fastback cars. The more you reduce the drag and keep flow from separating, the more the rear end wants to take off. If you look at a Z in profile, you can pretty easily imagine the leading edge of the wing being analogous to the windshield/roof junction. Similar to the results obtained for Sedan model it is observed from Figure 12 that the low velocity region near the roof is narrowed, which again changes the drag and lift coefficients. It can also be found from Figure 12 that the lift is decreasing, which in turn increases the downforce of the hatchback model car. In the case of Hatchback model the change in the value of drag coefficient (i.e. ¨CD = –0.008) and lift coefficient (i.e. ¨CL = –0.046) is observed from Figure 12. Comparing Figure 10 and Figure 12 it is clear that the narrowing of low velocity region is more prominent in case of Hatchback than in Sedan model and hence increase in downforce will be more for the hatchback model. To your point about the front of our roofs resembling the leading edge of a wing, I'd have to agree with a caveat. VGs aren't on aircraft wings to help out at cruising AoAs. They're there to stave off stall and maintain lift and control power at extreme angles of attack. A car never really sees anything other than a static angle, so having them in the flattest area doesn't make sense. You could put them ON the windshield in an effort to help the turning onto the roof. That would be an interesting study. Putting them on the roof near the front, though, is going to be less effective than further downstream where the closeout angle is more severe. On to the link you posted. There's a lot of things going on there that make me question the quality of the CFD work. The comparison images are almost worthless since the writers didn't use consistent color scales, and detail is lost since they used banded coloring. I could go on, but it's not entirely relevant. Just be wary of blindly trusting that study. That said, their results aren't necessarily wrong. They very well could be reducing lift the amount that they quote. That doesn't have anything to do with what VGs are intended to do and would be more of an unintended result. Their sole job is to re-energize the boundary layer by tripping it and creating vortices, thereby keeping flow attached. In the case of the Evo, their purpose is to reduce drag and get more air on the wing. If you speed up the flow over the rear of top side of an S30 the pressure is going to drop and lift will go up. That's just physics. It's why 911s had to go to whale tails to keep the rear ends down. First, let me say that I'm enjoying digging into this, so thank you. Second, I'll point out that I'm not an engineer and have no training whatsoever, but I have read a few books on aero. Third, I think you're missing something here. When you look at a plane wing that is not stalled, it makes aerodynamically EFFICIENT lift. A stalled wing still makes lift, but there is more drag than lift and that's what causes the plane to fall out of the sky. Just look at the yarn on the plane wing. When it isn't stalled, the yarn is pressed down on the wing surface. When it stalls, the yarn is no longer pressed down, and it flails all over the place. This is proof that there is more downforce with the flow attached to the surface than when it stalls. The yarn is literally pressed down on the wing surface. Back to cars: the thing that we're trying to prevent is the rear of the car from acting like a stalled wing, and the reason why we're trying to prevent it is to reduce the size of the wake behind the car and its drag. Also, if we have a spoiler or wing that would be in the region of separated flow, we can make it work. 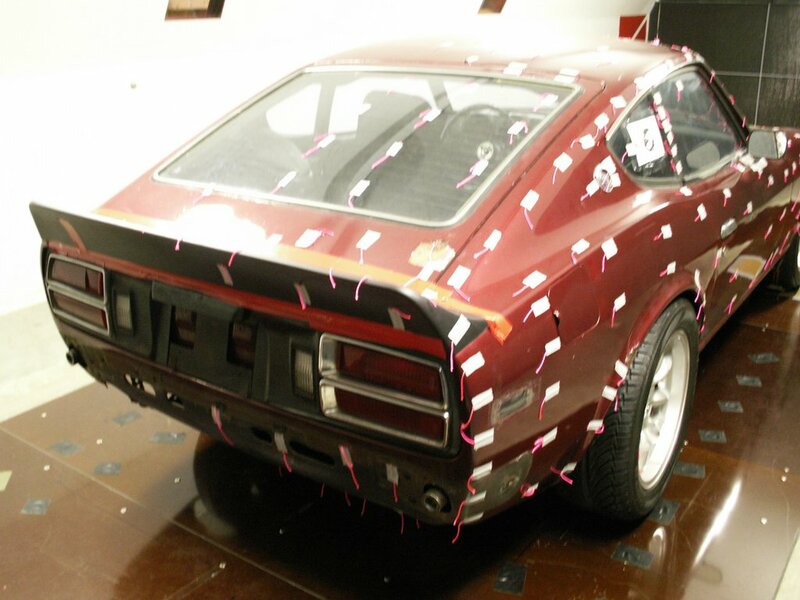 The purpose of the whale tail is to change the angle of the flow off of the back of the car. If the flow over the top of the car points down, you will get lift. If it points up, you will get downforce. You can intuit this if you watch F1 in the rain and see the rooster tails shooting up 20 feet behind the cars, but it's not something that I ever read in a book. There is a guy on youtube that runs Gray's Garage and he does water flow testing with model cars, and he talks about this at some length, in addition to showing the rolling separation vortices behind various models. Pretty interesting. Thought this through a little more. I think a better way to explain would be to say that a stalled wing doesn't create lift, but instead creates drag because of the big wake that is created by the flow separation. You wouldn't say that there is more pressure on the rear of the car inside the wake than on top of the car, and likewise there is more pressure on the top of a wing when it flow is attached than there is when it is stalled. Thank you as well. Talking aero on Zs is more fun for me than discussing it on my day-to-day work. You're mistaken on this. The yarn lays nicely on the surface inside attached flow because the smooth airflow is pulling it backwards. When flow is separated, it swirls, pulling the yarn every which way. Here's a lift curve for a couple NACA airfoils and a flat plate. In a fluid, pressure varies inversely with velocity. The faster a fluid flows along a surface, the lower the pressure is on that surface. Once separation occurs, the average pressure difference between the upper and lower surfaces shrinks or disappears, which causes the loss of lift. Agreed. Attached flow minimizes drag and allows any other aerodynamic device to work better. Thought this through a little more. I think a better way to explain would be to say that a stalled wing doesn't create lift, but instead creates drag because of the big wake that is created by the flow separation. You wouldn't say that there is more﻿﻿﻿﻿ pressure on the rear of the car inside the wake than on top of the car, and likewise there is more pressure on the top of a ﻿wing when it flow is attached than there is when it is stalled﻿﻿. Kind of the same response as above, but a wing's lift doesn't correlate directly to its drag. Look up the term "drag bucket" to see how you can minimize drag on a wing by choosing an airfoil that fits your flight profile. That's the second time I've been wrong in a very similar way in about a week's time: the other was trying to relate a traction vs slip angle curve to a tire that was broken loose. Ah well, thanks for the correction. What did you think about the videos I posted? Don't worry about it. Even people who deal with aero design on a regular basis get things wrong. I really like Gray's Garage. Those two videos are good. I used to race a Mk1 MR2, so the short series of clips he posted for them was very useful. I have to admit that I’ll not take my Z to the track or really plan on going crazy fast down the Autobahn (I believe a Z is more at home on twisty roads), so I don’t think a tiny bit more or less downforce will play too much of a role. Of course, in a sub-1-ton car with RWD and no traction control/ESP, it helps to get some sort of rear downforce. A big plus would be that, if I do go and use a racing fuel cell, putting the cap in the hatch would make the TÜV happy and not need me to run a pipe to a (plastic) window.